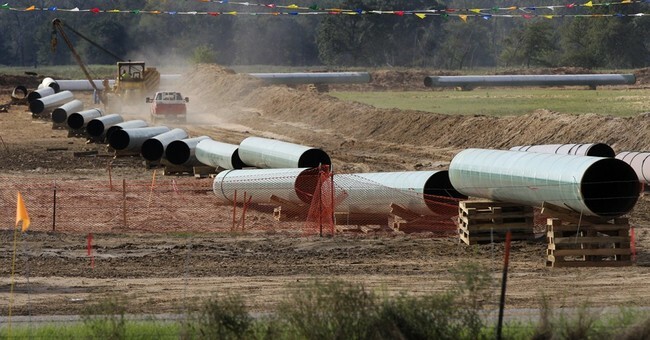 Don’t declare the Keystone XL pipeline dead just yet. Especially now that the GOP will control both sides of Capitol Hill starting in January. We talked to Senator John Hoeven, R–ND today on Powering America Radio. Senator Hoeven was Governor Hoeven for a decade before he went to the Senate and has been a strong conservative leader in both positions. Obviously, the Keystone would cut straight through North Dakota into Canada before taking a hard left over to the tar sands region of southern Alberta. In May, Senator Hoeven saw a window of opportunity and tried to attach Keystone approval to an Energy Efficiency Bill and it appeared the Senate Bouncer, Harry Reid, might have supported it. He didn’t, and the hope for it hinged on November 4ths mid-term elections. Now, it’s a top item on the Republican’s agenda and you should expect Senator Hoeven to introduce the bill in the Senate early-on in the 2015 session. It should clear the House with relative ease and make its way to Barack Hussein Obama’s desk. Senator Hoeven told me this will be a straight-up bill. Veto it, Mr. President, or approve it and let’s get on with it already. Any bets on what will happen then? The Senator said if he vetoes, there’s a chance it could actually be overturned. I appreciate guys like John Hoeven. He’s pro-energy, having enjoyed the direct benefits of what the oil boom has done for his State. He has the gubernatorial experience we need in Washington. That’s where you learn government – in the Governor’s office. His career has been right between the lines, with a distinguished banking career before he turned to politics. Talking to him encouraged me again that there’s a ray of hope here. We need to elevate the John Hoeven’s of the world in Washington, D.C. He’s cut from the cloth of the kind of leaders who could turn this around. Getting the Keystone bill through Congress won’t be the problem. It’s selling it to the Democrats and convincing the President that 6 years has been long enough that will be the true art form. This is shaping up to be one of the early and telling bills that will show us what the next two years is going to look like. I hope and pray that shovels and dirt will soon be moving in the Dakotas. It will be nothing but good for America. Powering America Radio is heard daily on the Wall Street Business Network at 4:00 Eastern and is co-sponsored by Crude Energy, LLC and Breitling Energy Corporation.